<h2>Honoring History, Celebrating Pride</h2> — Danielides Communications, Inc.
Remembering Stonewall for most LGBTQ people is not about real memory, since they either were not in New York City during the Stonewall Riots in 1969, not near the age of consent, or not even yet born. Our “memories” of Stonewall, individually and collectively, mostly hinge on stories and images related to us by writers, filmmakers, and other artists and activists who have documented the rebellion that started the gay civil rights movement in the U.S.
There’s still some dispute about just who was and was not actually inside the Stonewall Inn, located in New York City’s Greenwich Village, when it was raided by police. Historians believe the patrons were mostly gay men, drag queens, hustlers and homeless youth, and transwomen. Neighbors, mostly young queers, hippies, and yippees, came out to support those inside the bar who, having had it with decades of police and mafia harassment, finally fought back. There were bottles thrown, broken, and used as weapons, physical altercations of all types, police beatings of Stonewall patrons, passersby, and neighbors, too. And, although many media outlets ran bigoted, sensationalistic stories, such as the New York Daily News’ July 6, 1969 article, headlined “Homo Nest Raided, Queen Bees Are Stinging Mad, the reverberations of the Stonewall Rebellions were felt by LGBT people across the country. A year later, on June 28, 1970, the first Gay Pride marches took place in Los Angeles, New York City and Chicago to commemorate the anniversary of the Stonewall Riots. Today, because of Stonewall, and those who continued to organize afterward, LGBT people now take for granted many liberties earlier activists never dreamed they would be afforded in their lifetimes. 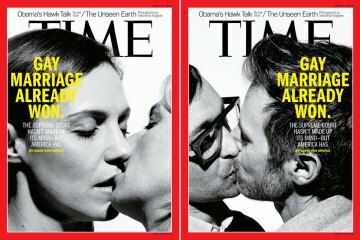 In March, TIME featured a split cover — one featuring a lesbian couple kissing, the other a gay male couple kissing. The covers generated plenty of controversy, and drew both grateful support and sharp criticism. The public discourse and media conversation about LGBT rights has changed a great deal since 1969. And, we have come a long way since Stonewall, but there is still much forward movement to be made regarding the rights of all LGBTQ peoples.